A three-year project that aims to strengthen the efforts of the government and civil society organisations (CSOs) in Kyrgyzstan to prevent torture was launched last week at a press conference in Bishek. 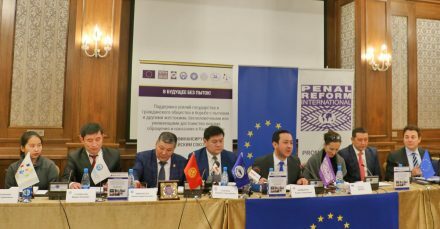 The project, which is funded by the European Union, is being implemented by PRI in partnership with the Human Rights Ombudsman of Kyrgyzstan; the National Center for the Prevention of Torture and Other Cruel, Inhuman or Degrading Treatment or Punishment; foundation Kylym Shamy; human rights movement Bir Duino Kyrryzstan; and the Child’s Rights Defenders League. The project aims to build the capacity of CSOs to prevent torture through democratic dialogue with the government, as well as enhance the capacity of law enforcement bodies to conduct effective and lawful interrogations, and improve the capacity of a newly established torture investigation unit. A comprehensive and independent judicial system to hold torture perpetrators to account will also be developed. Kyrgyzstan has taken a number of measures to eradicate torture, and, in 2016, the UN Special Rapporteur Juan E. Méndez noted that ‘The country-specific measures that have been taken provide the basis for building a policy of zero tolerance for torture, stressing Kyrgyzstan’s readiness to continue dialogue and work with UN mechanisms, which gives hope that through persistent efforts effective means of investigating, documenting, combating and ultimately eradicating torture can be developed and implemented.’ However, there are still a number of issues that require special attention and consolidation of efforts of both the state and society, since despite all measures taken, torture continues to occur. Statistics show that most allegations of torture or cruel, inhuman or degrading treatment or punishment are made at the pre-trial stage. The project will take the form of educational training, courses and study tours; visits to closed institutions; national advocacy campaigns; the creation of a network of CSOs; and the compilation of reports and strategic documents. Pilot projects in police stations in the country’s Osh and Chui regions are also planned. Find out more about PRI’s work on torture prevention, including our Detention Monitoring Tool, which provides practical guidance on how monitoring bodies can focus on a number of systemic issues that are particularly high-risk factors for torture or ill-treatment.